RheinEnergieStadion was built to replace Cologne’s old Müngersdorfer Stadion with the perspective of the city being one of the host cities of the 2006 World Cup. Demolition and construction of the stadium were done gradually so that FC Köln could keep playing their home matches at the stadium. Works were completed in 2004. The new stadium came at a cost of €119.5 million. RheinEnergieStadion hosted five games during the 2006 World Cup, which included four group matches and the round of 16 match between Switzerland and Ukraine (0-0). RheinEnergieStadion is located in the west of Cologne, just over 6 kilometres from the city centre. The stadium can be easily reached by car from the A1 motorway, which runs west of the city. Take exit 103 and follow the Aachener Straße east towards the city centre. After a little more than a kilometre the stadium will turn up on your right. Following the Aachener Straße further east will get you to the city centre of Cologne. If using public transport, one can reach the stadium with tram line 1. From station Neumarkt in the city centre it takes about 15 minutes to reach stop RheinEnergieStadion. On matchdays special tram services connect the Hauptbahnhof railway station and station Neumarkt with the stadium. The fare is included in the match ticket. RheinEnergieStadion is located in the Stadtwald park in a predominantly residential area. There is little around in terms of eating and drinking, though the lively Cologne inner city is a short tram ride away. There are no hotels directly near the RheinEnergieStadion, but still a few options not too far away. There is the affordable Dorint Hotel near the A1, which is about just at walking distance (but also on tram line 1), and the more expensive Best Western Hotel Brennerscher, which lies a little further south, but can still be walked from to the stadium. 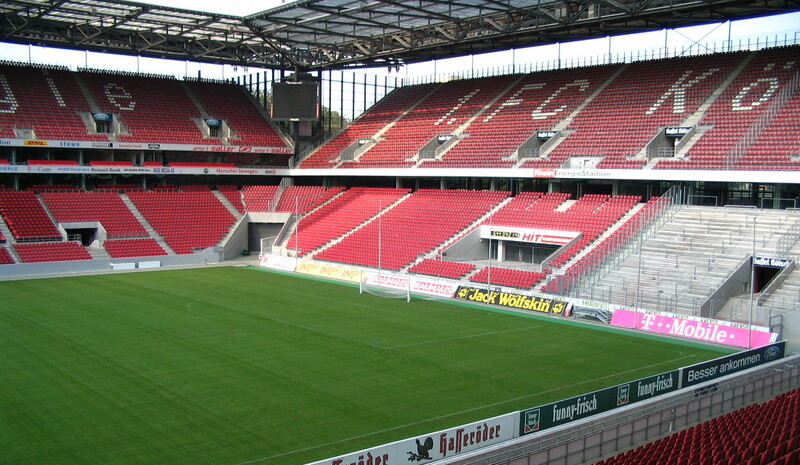 Click here for an overview of hotels near RheinEnergieStadion. Alternatively, there is a wide array of options in Cologne’s city centre, which can be explored here. Tickets for Köln matches can be bought online, by phone +49 (0) 1805 32 56 56, at the Fanshop at the RheinEnergieStadion, or at one of the other selected sales points (e.g. the Theaterkasse at Neumarkt metro station in the city centre). Köln regularly sell out in the Bundesliga and it is therefore advised to book tickets in advance. If you do miss out, there might still be tickets available through the club’s official ticket exchange (for face value), or otherwise through secondary ticket websites such as viagogo, though expect to pay over face value. Ticket prices depend on the opponent with those for cheap low profile matches ranging in price from €23.00 for a seat in one of the corners to €53.00 for a central seat at one of the long sides. Standing costs €16.00. Prices for high profile matches start at €37.00 and run up to €75.00. Prices for standing remain the same. Kölner Sportstätten offer guided stadium tours at the RheinEnergieStadion that last 75 to 90 minutes and include a visit to the FC-Museum. Tours run a few times a week typically in the afternoon hours. Check online for upcoming dates and bookings. For more information call +49 (0) 221 716 16 104 or email info@koelnersportstaetten.de. FC-Koeln.de – Official website of 1. FC Köln. Koelnersportstaetten.de – Official website of the RheinEnergieStadion. Koeln.de – Cologne tourist information. KVB-Koeln.de – Cologne public transport information.